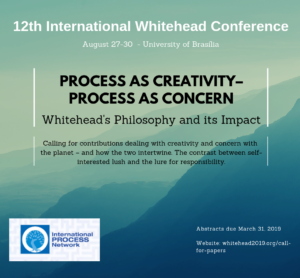 Taking place on the beautiful campus of the University of Brasilia in Brasilia, Brazil, the 12th International Whitehead Conference will address of creativity and concern in the framework of broader discussions of Whitehead’s philosophy and its impact. Following from the 11th IWC which focused on Nature in Process, this conference will welcome contributions dealing with creativity and concern with the planet – and how the two intertwine. In general, the focus is the contrast between self-interested lush and the lure for responsibility. The first IWC in Latin America – a continent plagued by disastrous colonial endeavors – intends to reverberate the local tension between the expansion of a mode of life and the covering-up of the other, in the apt phrase of Enrique Dussel. Abstracts of 400 words outlining your proposal are due March 31, 2019. There will be two Young Scholars Awards. The winners will be announced on the IPN website. The award includes airfare and conference fee for the 12th International Whitehead Conference in Brazil, as well as publication of papers in the conference proceedings. The papers should be prepared for anonymous evaluation (with the data about the author on a separate sheet) and should be submitted electronically at the following e-mail address: dzhadiaiev@windowslive.com.